U4 has no included setting, allowing you to explore the rules in whatever context you wish. The rules are offered in a general way, not assuming any time period. The equipment lists a wide range of various firearms. Though most are modern, there are quite a few that are retro and futuristic. The new "Ladder" system which offers more adjustability with character creation. Modify your class with one of seven ladders. Eleven new classes including sniper, faceman, infiltrator, and the grappler. All new weapons including traditional firearms, rocket launchers, and laser rifles. All new opponents from fanatics to tanks. Neuroglyph Games: "Chris Dias has done a remarkable job in transforming 4E rules into something very useful to gamers looking to take a break from heroic fantasy – but still get to play a 4E style game! The rules are very innovative, as are the new mechanics for character design, and I certainly wish the author all the best of luck with this release, and with the upcoming Neurospasta setting!" Roleplayers Chronicle (Todd Crapper): "Ultramodern4 is a magnificent accomplishment in alternative game design and I can’t help but feel it is superior to D&D, even if it is required to play this game. It achieves what D&D could not because it was not held down to a particular reference point – previous versions of D&D – and capable of stretching its reach far beyond what many experienced players may have expected of these troubled mechanics. I only hope the GSL does not make this product a limited edition." Solo Nexus: "Be warned! Ultramodern4 IS a “crunchy” book, although it is by no means a technical manual. Still, this is a product for those who WANT to take a very radical departure with their 4E game. Do not get this if you’re mildly curious about what a Dwarf Barbarian would be like armed with a rotary cannon. Get this if you truly want to bring modern and futuristic combat to life with the 4E system." Points of Light: "This book feels like a good spiritual successor to 3rd Edition's D20 Modern. The lack of an implied setting or time period, coupled with the fact that you can mix and match content from either book makes it easy to do an Urban Arcana game, and I could see rolling in Gamma World to get something a lot meatier if that is your thing. Heck, why not lump it all together and have your very own 2nd Edition of Rifts, if even by name only? RPGNow: "Overall I have to give this product a thumbs up, its quality is not only in its content but its layout as well, I personally have not had many 4e 3rd party products with the production quality that DEM puts in its products." Free Preview on RPGNow: We have two files available for download. The first is the Ultramodern4 OGL pre-release, showcasing the first six pages of the Ultramodern OGL. As we stated, this OGL has no layout or artwork; that's saved for final product. The second file is the Ultramodern4 "Hot Sheet"--a reference sheet for all the common new rules added to UM4, sans skills. There, you will find the new damage types, basic attacks, and keywords. Gnome Exclusive: NeuroSpasta Questions and Logo: "Earlier this year, Dias Ex Machina (DEM) games posted a press release for their upcoming RPG, NeuroSpasta (take a look…I’ll wait). NeuroSpasta is a Sci-Fi game, and the first Sci-Fi product based off the GSL. This is not DEM’s first attempt at moving the GSL past fantasy. Their first product, Amethyst is a combination of Fantasy and Modern settings, which is due out in the Fall; available through Goodman Games. Previously, here on the Stew, I reviewed their Free RPG Day offering, Hearts of Chaos, which showed that there is room in the GSL for modern weapons, and for more complex themes." 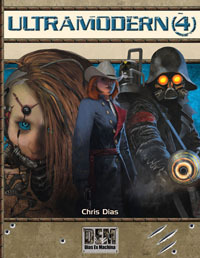 RPGNow: "This is a company to watch as they are to 4th edition as pathfinder was to 3.5 so if you have not picked up or looked at 4th please give this companys books a look, who knows you might find something you never knew you missed." RPGNow: "D.E.M. Games has set the standard for 4e modern and has no apparent challengers."